The V Spanish Para-Badminton International Open was held from the 25th – 29th March in Alcudia, Spain. This BWF sanctioned event attracted many players from various countries around the World including the likes of Malaysia, Hong Kong, Denmark, India, and many other strong European Nations. 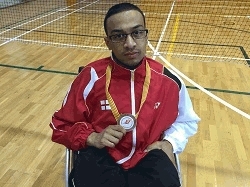 England and Notts’ Owen Kilburn competed in the wheelchair class 1 (WH1) mens singles and the wheelchair mens doubles. After strong performances in group D of the singles, including a 21-16, 21-14 defeat to 4th seeded Russian Pavel Popov, Owen managed to advance to the last 16 where he faced a very strong Indian player; Prem Kumar Ale. After losing the first game 13-21 Owen pulled away with a commanding lead of 18-12 in the second game. Unfortunately complacency and a loss of focus combined with Prem Kumars resilience lead to Owens 19-21 defeat and elimination from the Singles event. The dream ended in the semi-finals the next day after coming up against England team mates and 2nd seeds Martin Rooke and Connor Dua-Harper who proved to just be too strong. Owen finished the tournament with a Bronze medal in the mens doubles. Owen now hopes to build on from this experience and success as he prepares, with help support from Notts BA, for the next BWF Para-Badminton International competition in Ireland in June and the BWF Para-Badminton World Championships that are to be held at Stoke Mandeville stadium, England in September. Team England won a total of 3 Gold, 5 Silver and 6 Bronze medals.